It is important to make sure you are prepared and know how to remove a tick before you find one on you. I would highly recommend printing one of the tick removal charts. Put it somewhere where you can find it. 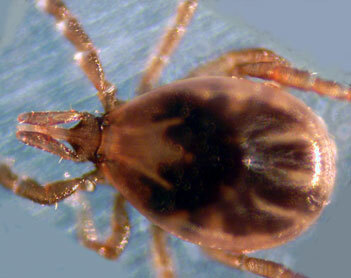 You may also be interested in the Tick Removal Kits and Tick Testing Laboratories. Use any substance on tick. Twist, squeeze, or otherwise agitate the tick. Note: Irritating the tick can cause it to regurgitate into your bloodstream, including any infectious disease it is carrying. Grasp tick as close to the mouth parts as possible with tweezers or tick remover. Be sure head parts have been removed 100%. Thoroughly clean skin with antiseptic. Wash and Disinfect tweezers and hands thoroughly. ALWAYS see a physician for possible diagnosis, testing and treatment, especially if tick parts remain after removal. SAVE THE TICK! And have it tested. Do not flush it or otherwise dispose of it. Note: Although tick and blood lab testing is not 100% accurate, this is the BEST way to know if you have been exposed to Lyme Borrelia or any possible co-infections. If the tick has any of these diseases, you NEED to be treated for them immediately. DO NOT WAIT for symptoms or a rash to occur!!!!!!!!!! Proper removal of ticks decreases your chances of infection.